Ok, that big snow storm everybody was talking about that was going to hit the south? Guess what? No snow. It’s worse. Ice. This is one thing northerners don’t understand about southern drivers. Most of us are really good in the snow. But we usually get ice, sleet and freezing rain which is much more difficult to navigate. So, the storm is upon you and the roads are icing up. What now? Stay put. If you’re not a doctor, nurse, firefighter, policeman, or the operator of a nuclear power plant, stay off the roads. Rescuing you from a ditch or removing a stop sign from your spleen is not what these people need to be doing right now. If you or a loved one isn’t hurt or stranded, stay home. Don’t walk outside either. Everything is slick including your deck, driveway, patio, sidewalk. If you have a huge reason for going outside, like caring for farm animals, you’d be wise to invest in ice cleats or crampons.
. A slipped disc or broken arm is no fun on a nice, sunny day and it’s much less so on a cold, icy day. Charge all your electronics and rechargeable batteries. Keep your phone and laptop topped off in case the power goes out. Know where your flashlights and radio are and check the batteries in them. Ice builds up on tree limbs and power lines (and telephone and cable) making outages much more likely and more difficult to repair. Download music, movies, and podcasts to keep everyone entertained. Know where your auxiliary heat and blankets are. When you fire up a propane or kerosene heater, crack a window. These heaters consume the oxygen in the room and can build up CO2 in today’s tightly constructed buildings. If you have a generator, know where you’ll use it. It doesn’t belong in your house or garage. 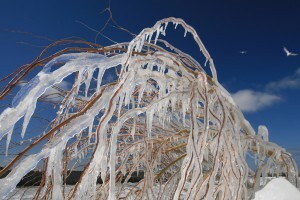 What tips do you have to share about surviving an ice storm AFTER it’s begun?